The Churchill Society of South Florida and Books & Books are pleased to present acclaimed journalist Paul Reid for a discussion of the most anticipated biography of the last two decades, The Last Lion: Winston Spencer Churchill: Defender of the Realm, 1940-1965. Spanning the years of 1940-1965, Defender of the Realm picks up shortly after Winston Churchill became Prime Minister, with his country on the brink of total defeat at the hands of Nazi Germany. More than twenty years in the making, Defender of the Realm presents a revelatory portrait of this brilliant, flawed, and dynamic leader. The Churchill Society of South Florida is dedicated to encouraging study of the life and thought of Sir Winston Spencer Churchill, advancing knowledge of his example as a statesman, developing and participating in student outreach programs, and engaging in other related charitable and educational endeavors. For more information, please contact churchillsocietyofsouthflorida@gmail.com or visit http://www.winstonchurchill.org. Paul Reid is an award-winning journalist and was a friend of the late William Manchester, a hugely successful popular historian and biographer. Manchester wrote the first two volumes of The Last Lion (an eventual three-volume biography of Sir Winston Churchill), in addition to assorted works of journalism and several other books: Goodbye Darkness, A World Lit Only by Fire, THE GLORY AND THE DREAM, The Arms of Krupp, American Caesar, and The Death of the President. In late 2003, William Manchester was in failing health and asked Paul Reid to complete volume three of the Churchill biography, The Last Lion: Winston Spencer Churchill, Defender of the Realm 1940-1965. The book has met with wide acclaim and was praised in these words in The Boston Globe: "Masterful... breathtaking... Reid finished the race with agility, grace, and skill.... This is a book that is brilliant and beautiful and evocative." Join us at Malaprop's for Paul Reid's reading and signing of this new masterpiece! Harvard Book Store is pleased to welcome acclaimed journalist PAUL REID for a discussion of the long-awaited account of Winston Churchill's last 25 years, The Last Lion: Winston Spencer Churchill: Defender of the Realm, 1940-1965. With the third volume of his monumental biography of Winston Churchill under way, the ailing William Manchester asked his friend, the journalist Paul Reid, to help complete the massive project. Some twenty years in the making, the trilogy is a comprehensive portrait of the world leader. The final installment focuses on the period from 1940 to Churchill’s death in 1965, years in which Churchill persuaded Roosevelt to join Britain in the struggle against Nazi Germany and then eased his country into its new role in a world dominated by the United States. 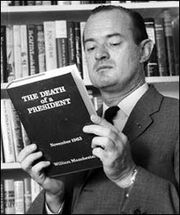 William Manchester is currently considered a "single author." If one or more works are by a distinct, homonymous authors, go ahead and split the author. William Manchester is composed of 13 names. You can examine and separate out names.